This is an incredibly moving story. A journalist embedded with an SAS team, Connor is looking for answers and determined to tell the truth about the experience of soldiers in Iraq. His powerful experience brings more questions than answers as he becomes part of the tightly knit elite unit. Garrett Leigh’s gritty story of modern warfare is frighteningly convincing. She makes Iraq come to life and her soldiers are larger than life. Connor is thrust into a conflict without a frontline where enemies are hidden, the threat is constant, and essential equipment is scarce. Long stretches of tedium are offset by moments of pure terror. The relationships between the soldiers are intense and fierce, and death is also a constant reality. The men in this story, Connor and Nat, are complicated characters. Nat is torn between resenting Connor’s presence and the threat he presents to the team, and welcoming his company and enjoying his friendship. As a civilian journalist, Connor struggles with Nat’s actions and decisions as his experience in Iraq challenges his personal moral code. The chemistry between these two is hot but this is more of a war story than it is a romance. Garrett Leigh’s trademark angst is here, but it materialises as a futile struggle for truth and absolutes. The friendships in this story are as powerful as the central romance (which isn’t always central). This is a beautifully crafted and very difficult war story. It was a powerful read. Written in 2016 but set in 2006, it is still chillingly relevant, especially with the publication of the Chilcot report in 2016. This is a slightly different story from Garrett Leigh, but as always, her characters are wonderful and it is carefully and thoughtfully written. 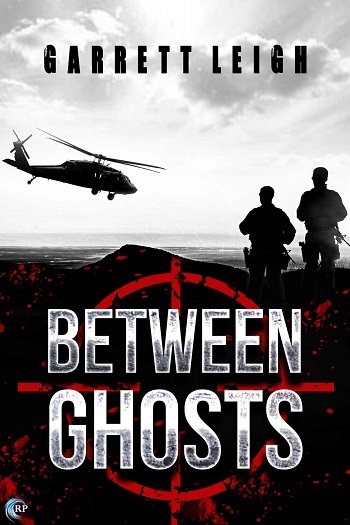 Sarah reviewed her personal copy of Between Ghosts by Garrett Leigh for this post.